The OmniFold 3000 Automatic Folding and Gluing System is a fully modular converting system designed to fulfill today’s needs and grow to meet the future demands of commercial printers, packaging manufacturers, and direct mail manufacturers. Built to maximize converting capabilities while minimizing set-up time, the OmniFold includes features that bring productivity and innovation to a new level. These features include: synchronized touch-screen controls, interchangeable feeding units, modular alignment system, modular pre-break device, interchangeable bearing bed transports and interchangeable vacuum transports. The OmniFold also delivers the quality and rugged reliability you’ve come to expect from Kluge. 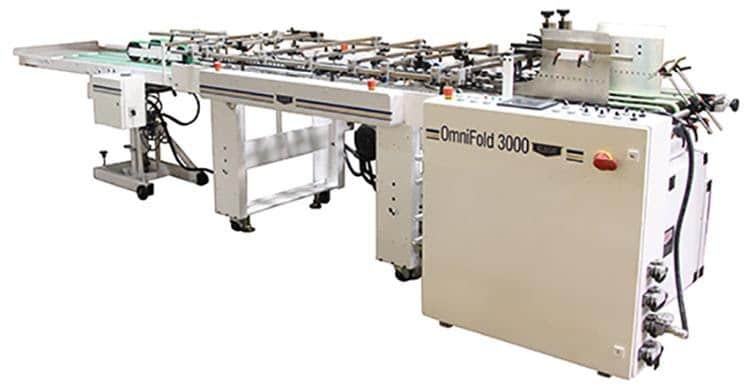 OmniFold 3000 short configuration for converting boxes, sleeves and other straightline products, but easily changed to be able to do other jobs as well. This configuration includes Friction Feeder in the Docking Station, an IL6 converting table and a stacker. OmniFold 3000 configured for converting cartons and boxes with a friction feeder in the docking station, and IL3 converting table, IL6 converting table and a compression stacker for delivery. An optional Fold Hook kit is available for converting auto-lock bottom boxes. For more information about the OmniFold 3000 Automatic Folding and Gluing System or Kluge’s other line of print finishing equipment, check out our OmniFold 3000 page.